Tea Tree Oil known as Nature's Antiseptic. This versatile essential oil has powerful antiseptic and anti-bacterial properties. 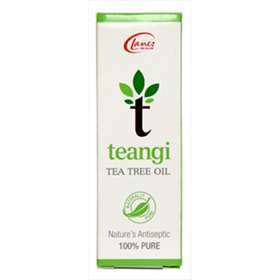 Lanes Teangi 100% Pure Tea Tree Oil can be applied directly to the skin or it can be diluted with sweet almond oil or wheatgerm oil for those with sensitive skin. A few drops can also be added to shampoo for complete hair and scalp treatment. Can be diluted for aromatherapy massage. Where required apply a few drops of Teangi Tea Tree Oil diluted in sweet almond or wheatgerm oil. Do not use if allergic to Tea Tree Oil. Avoid contact with the eyes, if affected wash well in cold water.